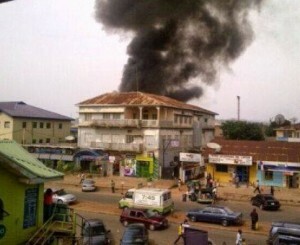 JOS, Nigeria (Morning Star News) – Suspected Islamic extremists set off two bombs in a mainly Christian area of the central Nigerian city of Jos today, causing massive destruction of human lives and property, sources said. Two days after a suicide bombing in northern Nigeria killed an estimated 20 people, Islamic extremist Boko Haram rebels were suspected of setting off the bombs near shops belonging to Christians in the central market district of Jos. At press time an official with the National Emergency Management Agency said at least 45 people were wounded and 118 bodies had been recovered, with more expected to be found in the rubble. The first bomb exploded at 3 p.m., with the second one detonated about a half hour later, as efforts were underway to evacuate the dead and wounded. The bombs were planted in the Railway Terminal area.